Bowness is a busy tourist town on the eastern shore of Windermere, roughly halfway between Ambleside and Waterhead to the north, and Lakeside and Newby Bridge to the south. There has been a village here since the 15th century but the area really developed with the opening of the train station at Windermere in 1847. Today the town is the most popular tourist destination in the Lake District. At the World of Beatrix Potter all 23 of the author’s tales are brought to life through a series of three dimensional displays. The popular attraction shares a building on Crag Brow in Bowness town centre with the Old Laundry Theatre, one of only a handful of in-the-round theatres in England. The Lake District Visitor Centre at Brockhole is the main visitor centre of the Lake District National Park Authority and is housed in a Victorian mansion on the shores of Windermere, two miles north of Bowness. It offers a wide range of activities and attractions for both adults and children including an adventure playground, crazy golf course, indoor play area, climbing wall, café, gift shop, plus kayaking and sailing lessons. The extensive gardens were designed by Victorian landscape architect Thomas Mawson and offer fantastic views over the lake. Blackwell lies in an elevated position above the lake, 1½ miles south of Bowness, and is one of the finest buildings to emerge from the Arts and Crafts movement. It was built at the turn of the century by Mackay Hugh Baillie Scott as a holiday home for Sir Edward Holt, owner of Holt’s Brewery in Manchester. It is now managed by the Lakeland Arts Trust and open to the public. Despite all these attractions, the most popular thing to do in Bowness is to take a boat trip on the lake. Windermere Lake Cruises carry over 1.3 million passengers every year, making them the busiest tourist attraction in the Lake District and one of the top 10 paid attractions in England. From Bowness passengers can cruise north to Ambleside (Waterhead) or south to Lakeside. Attractions in Ambleside include Bridge House, Stock Ghyll Force and the Armitt while Lakeside is home to the Lakes Aquarium and the Lakeside and Haverthwaite Railway. The most popular walk from Bowness is the short climb to Brant Fell. The route starts on Brantfell Road in the town centre and takes around one hour there and back. At the summit visitors are rewarded with views of the Windermere, Crinkle Crags, and the Langdale Pikes. With a desirable location next to the lake, cheap hotel accommodation is Bowness is in relatively short supply. Properties with views of the water command high prices. More reasonable rates can be found at the guest houses and b&b’s on Lake Road and New Road, heading towards Windermere town centre. Bowness is easily reached from the M6 motorway. From the north leave the M6 at Junction 40 (near Penrith), take the A66 for 1 mile, and then follow the A592 for around 25 miles. From the south leave the M6 at Junction 36 and take the A590 and A591 to Windermere (town). From here take the A5074 (Lake Road) to Bowness. Parking in Bowness can be difficult, especially in the summer. Car parks in Bowness include the Rayrigg Road Car Park (LA23 3BZ), the Glebe Road Car Park (LA23 3HE), and the Braithwaite Fold Car Park (LA23 3HB). All are operated by South Lakeland District Council. 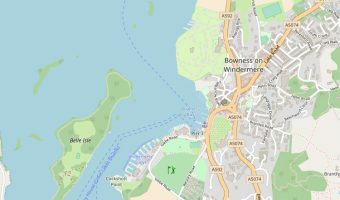 The nearest train station is in Windermere town centre, one mile from the centre of Bowness. First TransPennine Express run services between Windermere train station and Oxenholme train station (calling at Staveley, Burneside, and Kendal) and Manchester Airport to Windermere (via Manchester Piccadilly, Manchester Oxford Road, Bolton, Preston, Lancaster, Oxenholme, Kendal, Burneside, and Staveley). Oxenholme station is on the West Coast Mainline. Trains calling at Oxenholme include the Virgin Trains services between Glasgow/Edinburgh/Carlisle and London Euston/Birmingham New Street and First TransPennine Express services between Manchester Airport and Glasgow/Edinburgh. National Express operates a coach service between Whitehaven and London. Stops include Keswick, Grasmere, Windermere, Barrow-in-Furness, Carnforth, Morecambe, Lancaster, Preston, Wigan, and Birmingham. The Windermere Ferry departs from Ferry Nab, just south of Bowness, and offers a quick way to cross the lake to reach Hawkshead and Grizedale Forest.